MASNAA — On August 5, this observer decided, quite on the spur of the moment, to take a three day break from Damascus the next morning and make a quick trip to Beirut to do some errands because offices would be closed starting at dawn for Eid al Fitr celebrations (a day later for Shia Muslims). The annual Eid al-Fitr, being the festival of the breaking of the month long Ramadan fast, which observance is regarded as one of the Five Pillars of Islam. And by the way, this year has been undertaken, approximately 16 hours each day in inordinately hot weather in the Middle East. Let me say from the start: I did not anticipate the delay into which I was about to run. In fact, I felt that with a little bit of luck—and by leaving Damascus by no later than six in the morning—I might even break my record of 205 minutes total from Sameriyeh bus station to my apartment in Dahiyeh, south Beirut. Alas, it was not to happen. In fact, I ended up setting a record for my longest trip ever—a bit over eight hours for the usually much-quicker 88 km (55 mile) journey. It had not occurred to me that I would arrive at the new Lebanese border crossing building at Masnaa only to find that not only was it swamped, but that it had been a scene of bedlam for the past 20 or more hours. There were Syrian and Palestinian refugees fleeing to Lebanon, plus hundreds of people traveling there for this year’s Eid el Fitra holiday. I wasn’t the only one who miscalculated. Lebanon’s General Security, which oversees immigration facilities, apparently did so as well. When I got out of the car, the cross border processing center was surrounded by hundreds of travelers jostling and waiting. People were jammed and packed inside the building as well. Some shouted, waving their passports, trying to catch the eye of the overwhelmed but seriously under-numbered immigration officials behind their glass cages, while others were simply shocked, depressed by the mess they were in, and weak also from fasting. I gaped at the steamy, sweating assembly, and saw one of the supervisors (I know several of them from frequently crossing the border at Masnaa). He immediately waved and summoned me to push my way through the massive crowd to his private office. When I finally made it, he immediately took my passport and told one of the clerks to stamp it. Suffering yet another lapse into sometimes weak character, I kept my mouth shut about why he was helping an American who just arrived before assisting his fellow Arabs who had been waiting, Allah only knows, for how long. I still feel some shame about this personal flaw, and I know better than to jump a queue. But the General, sporting 4 gold stars on each of his two shoulder epaulets, did lecture me about what chaos he and his staff were in. A couple of security types held pistols above the travelers heads pointed at the ceiling as the crowd sometimes pressed sort of threateningly, against the counters and appeared that they might be about to storm them. Some immigration officers were scowling and shouting at people in the hall who were impatient to advance to the counters. Frankly, I hadn’t. For sure the supervisors’ all-male staff did indeed look utterly exhausted, even somewhat intimidated by the shouting throngs. But what I encountered next was even more disturbing. Grasping my stamped passport, I made my way out of the noisy, congested building, to the parking lot, and up to the door of our parked service-taxi. Here I found my two traveling companions, a middle-aged Palestinian couple from Yarmouk who I had just met at Samariyeh, taking their luggage out of the car. I inquired why they were removing their luggage, thinking perhaps we had to switch vehicles for some reason. The man put his hand on his heart and pointed toward Damascus. “Cham, (Damascus) we go Cham. Lebanon no!” he said as he flicked his chin upward. I did not understand exactly what the problem was, but assumed his documents were not in order—but then suddenly I realized that that didn’t make sense because every Palestinian must go to the Interior Ministry in Damascus before leaving Syria, war or no war, and pay $5 to have their documents checked and to receive an exit visa. And on top of the $5 fee in Damascus, they have to pay a new, higher fee at the border crossing—of $11—which until last month was only half that amount. With little choice, we bade each other farewell. Alone now, I settled down to wait for my driver, who seemed to have lots of friends at Masnaa. She was fleeing to Lebanon—after losing her husband and her home, although I did not learn all the details. But as with a couple of other Syrian refugees I have met, the poor dear did not have any relatives in Lebanon, and consequently planned, as have others in similar straits, to look for someone from her village in Palestine, hoping, praying, believing that such a person or persons would understand her plight and feel enough of a bond from the Nakba to help her. But outrageously, immigration at Masnaa barred her from entering Lebanon, and didn’t even take the trouble to give her a reason. “Go back to Syria where you belong,” the immigration clerk told her. “Ask UNWRA for help. They are responsible for you” she was told. But no one from UNWRA was to be seen, nor was any other Palestinian NGO. I gave her the phone number of two friends in Damascus and the last of my Syrian and American money. It is still the case in Syria, due to American-led sanctions, that ATMs and credit cards cannot be used. Consequently, many westerners, like me, regularly arrive at Masnaa from Syria, pretty broke. This mother and her babies are dreams. What happened to them is an outrage, and who knows how many others met similar treatment on the Syrian-Lebanon border last week? On that day at any rate, August 6, it seemed very much that most Palestinians were being forced back into Syria. Lebanese General Security officials need to get their stories straight. On August 10, a GS official denied any decision on the part of Lebanese authorities to prevent Palestinian refugees fleeing the fighting in Syria from entering Lebanon. In remarks to pan-Arab daily Asharq al-Awsat, the official, whose name was withheld, insisted, “The same measures are being applied on all the refugees (coming) to Lebanon from Syria whether they are Palestinians or Syrians.” General Security “is implementing the measures that were underway before the Syrian crisis started in terms of checking their documents and identification papers,” he added. Speaking frankly, his statement is utter nonsense. This observer spent nearly two hours at the Masnaa crossing speaking with Palestinians who were prevented from entering Lebanon. At the same time, I heard of no Syrian refugees being turned back—nor, of course, should they have been. Upon finally making it to Beirut, I emailed Amnesty International, Human Rights Watch, and UNHCR, among others. The GS’s spurious arguments that “their papers must not have been in order” insults one’s intelligence. It is well known, as noted above, that every Palestinian who wants to come to Lebanon or to leave Syria must first go to the Palestinian Refugees department of the Ministry of Interior in downtown Damascus and pay the aforementioned fee. Upon doing so, they are granted an exit permit. Every rejected Palestinian I spoke to that day at Masnaa showed me their permit from the Ministry of the Interior. In every single case their papers were in order. International humanitarian law requires that Lebanon abide by the principle of non-refoulement, a standard which prohibits sending refugees or asylum seekers back to places where their lives or freedom are threatened. On the day of August 6, this observer was an eyewitness to the government of Lebanon turning back scores of Palestinian refugees while remaining seemingly oblivious to the risks to their lives. 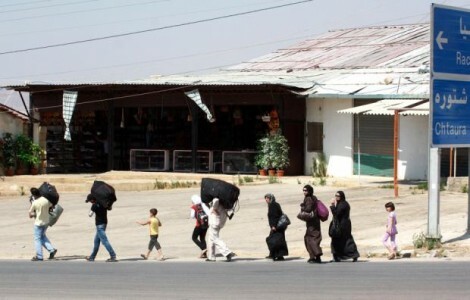 Palestinian families were, and still may be, stranded at Masnaa because they have no funds to return to Syria and were barred from entering Lebanon.